Dermal fillers can be applied on the hand for rejuvenation; restoring them to a fresh, fuller looking appearance. As we age, the tendons and veins at the back of the hand can become more prominent. 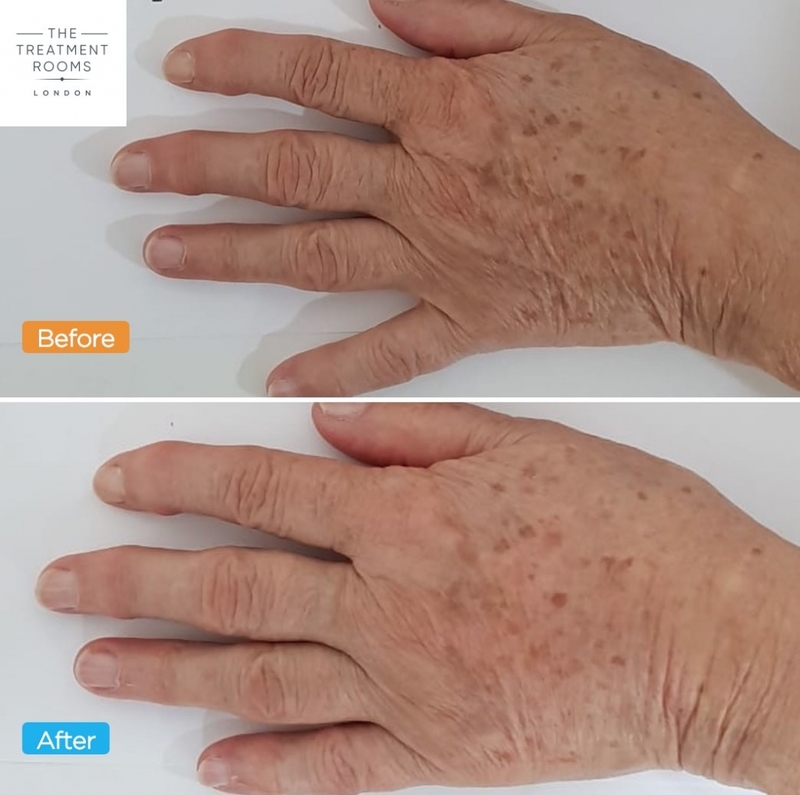 A dermal filler can be injected easily on the back of your hand, hiding any visible skin lines, tendons and veins associated with an aged appearance. For information on other areas of the body, including hand rejuvenation, that we treat with fillers please visit our section on Dermal Filler Injections. A dermal filler is a treatment that injects a gel (Hyaluronic acid) to restore youthful properties to your skin. Hyaluronic acid naturally occurs in your skin. As you age, hyaluronic acid decreases and this is thought to contribute to the appearance of aged skin. By injecting hyaluronic acid, dermal fillers aim to restore an appearance of youthful, rejuvenated skin. The Treatment Rooms’ doctor will hold a thorough consultation exploring your concerns and will establish a treatment plan that is best suited to you. In cases where you are completely happy with your treatment plan, you may receive your dermal filler injections on the same day. The injections may cause mild discomfort and there may be some soreness at the injection site after treatment. You will have numbing cream applied to these sites beforehand to help reduce the pain at the time of injection. The local anaesthetic in the dermal filler itself will help manage the pain after the treatment. The injection process will only last a few minutes. Before this takes place, our doctors will thoroughly assess your hand anatomy to accurately mark the optimal and safest points for injection. In total, your treatment will last for approximately 30 minutes. It takes as long as three weeks to see the full results of your dermal filler injections. Once you see the full results it usually lasts between six to 12 months, after which you may choose to repeat the treatment. As with any medical procedure there are always potential complications. As part of your consultation and consent, our doctors will go through the risks involved your specific treatment, answer any questions you may have and help you come to an informed decision about your care. Our doctors are happy to talk you through the medical knowledge and techniques they use to minimise these risks. Who cannot have dermal filler injections?